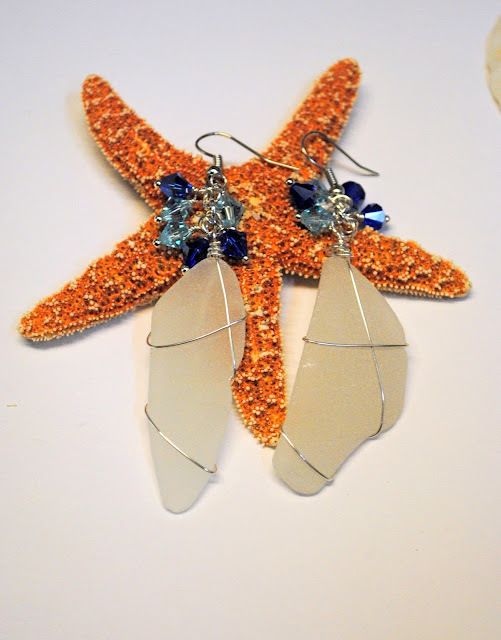 This weeks Featured Artisan is Stacy Lynne - The Loopy Chick! You will find darling Sock Monkeys and "Snuggy" Baby Blankets in her shop! All made by hand and all made with love by Stacy! Beautiful Crocheted and Knitted Gifts! It never rains but it pours at my house! Last week I almost ended up with bronchitis (and missed singing in our Christmas program at church). Yesterday, I slipped walking up the stairs and twisted my back. I guess it's better than falling down the stairs--I always manage to do things backwards it seems! And everything always happens at the holidays! So since, I missed posting yesterday's featured item, you have two to choose from today! 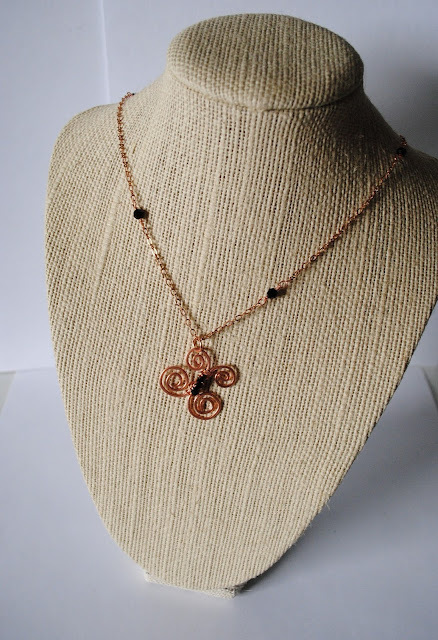 The first necklace is a copper butterfly I made by coiling copper wire and then wrapping it together with thin copper wire and black Swarovski crystals. 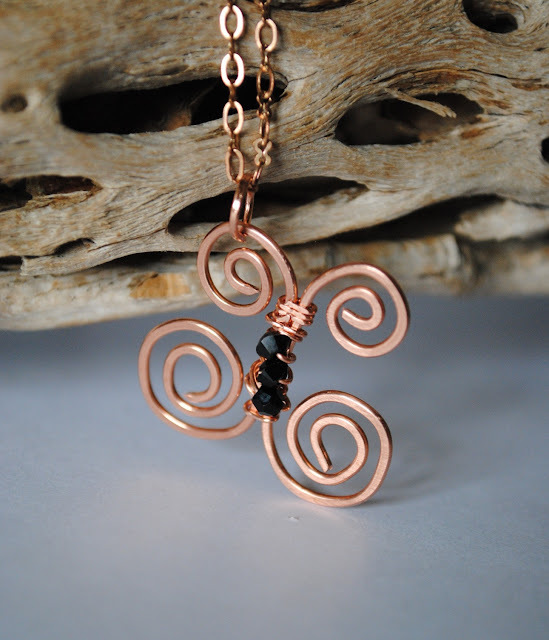 I love butterflies and this simple design showcases the beauty of a butterfly perfectly. 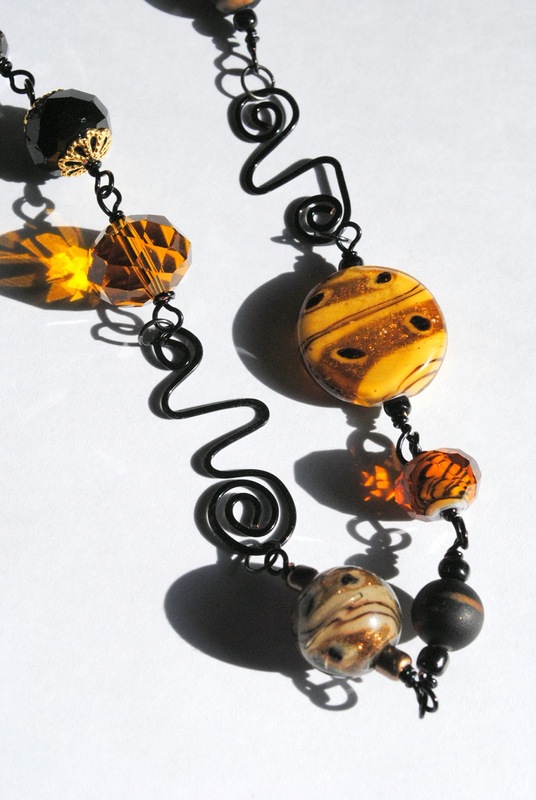 The second featured necklace was inspired by the glass beads that reminded me of the jungle cats. 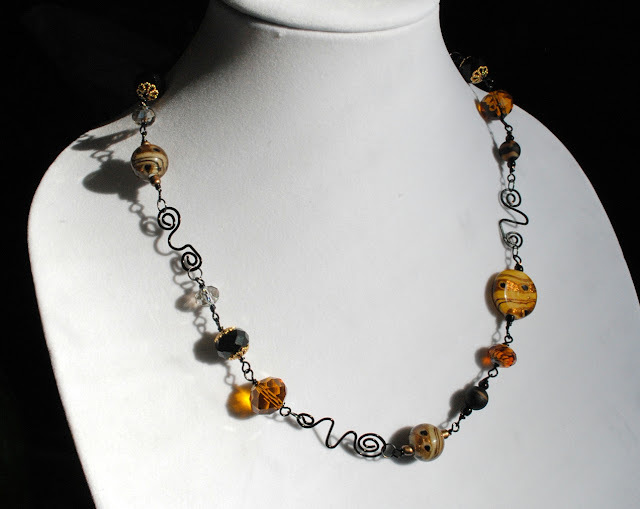 I used black wire to create free-form links and to join the beads together. It adds a bit of drama and mystery to the design. 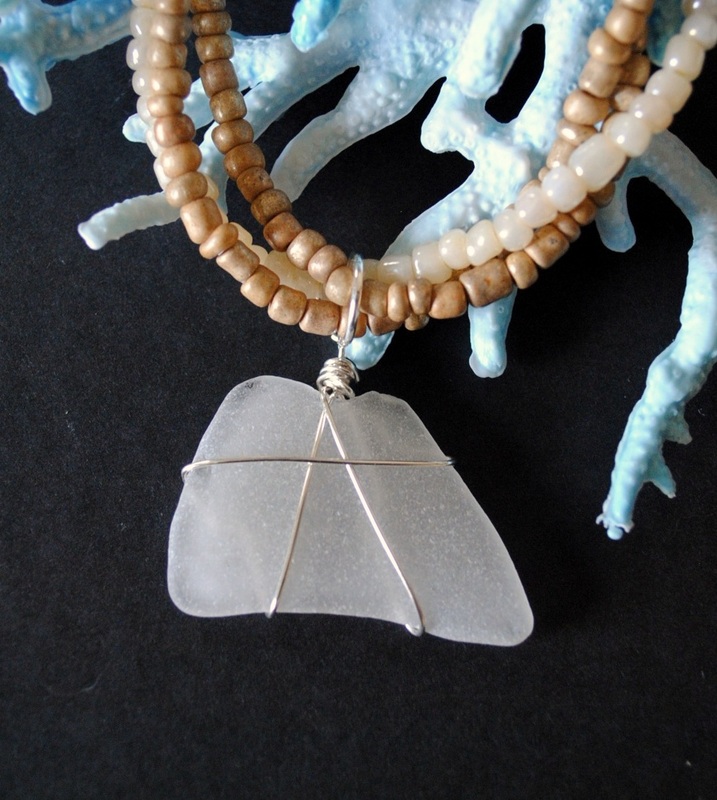 A triple strand beaded sea glass necklace. 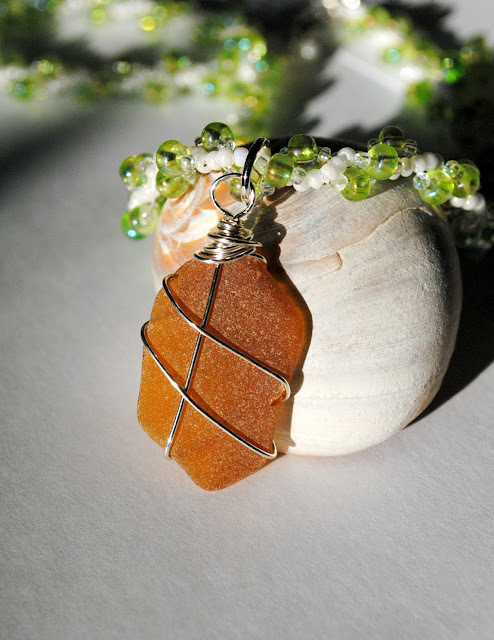 On a few trips to the beach, I was so excited to find such large pieces of sea glass! Well, to be honest I was glad my daughter found them...it's a struggle to pry her out of her computer chair but when I do, she has the most amazing luck. Larger sea glass requires a bit of creative thinking. I tend to want to keep it simple, but these large pendants look so out of place just hung from a simple chain. I love the understated elegance of this piece. You can wear it dressed up or dressed down and it can hold its own! Yesterday, I spent the day baking cookies with my daughter and her best friend/sister. 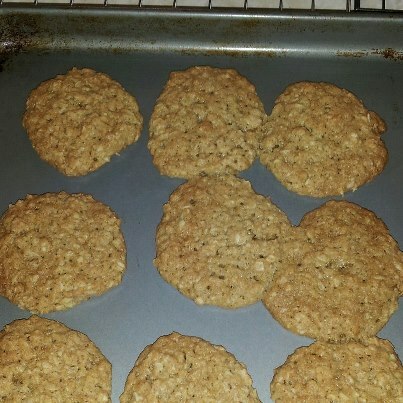 These were made with my mom's oatmeal cookie recipe. But my favorite cookies are my Granny's Cry Babies (molasses cookies). What is your favorite cookie of all time? 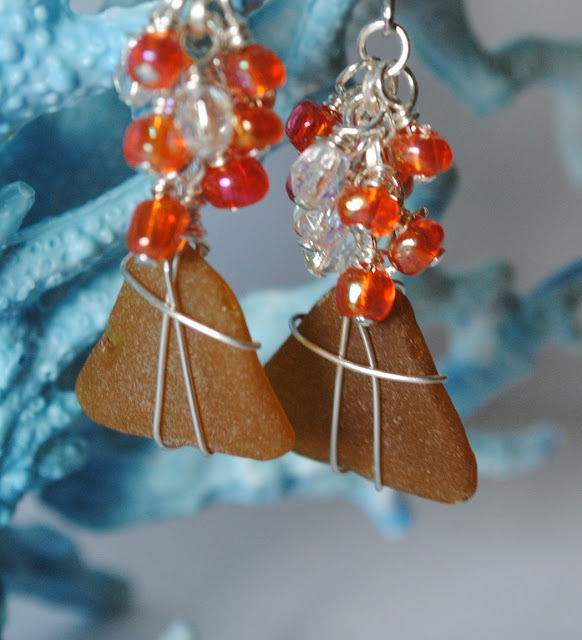 A fun pair of brown sea glass earrings! 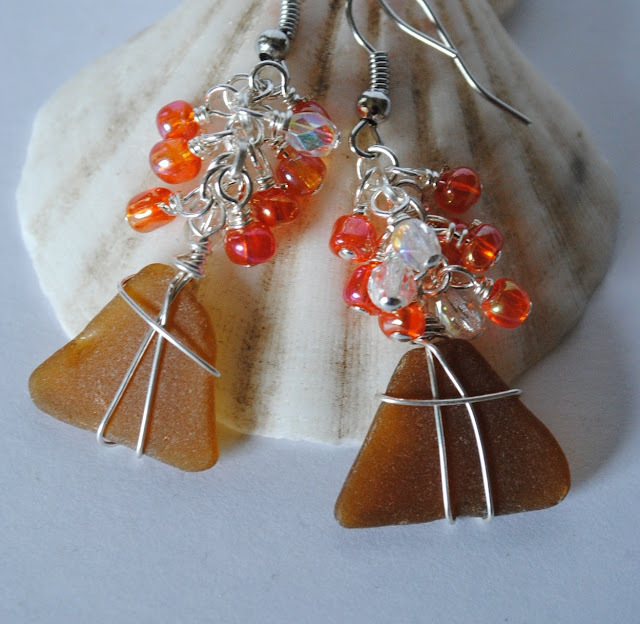 But it was summertime when I created these earrings and I needed a name for them and the colors reminded me of creamsicle ice cream. These earrings aren't just for summertime, though. They are a perfect colorful accent all year round! The presents are wrapped (most of them) and I'm going to try to bake cookies today. My daughter has asked for my special oatmeal cookies and I found sugar-free chocolate morsels for my diabetic husband so I'll be in the kitchen for most of the day. What are your favorite cookies at the holidays? I have to admit...mine are my Granny's molasses cookies. Maybe I'll make a batch of those this week as well! Sometimes you just have to break the rules, and that's what I did with the necklace! The color and shape of this piece of sea glass drew me in as I was walking the beach...and I didn't even care that it wasn't 100% jewelry grade. As you can see in the photo above, there are some places along the edge that are still a bit shiny and not frosted. But I think that adds to the beauty of this piece. 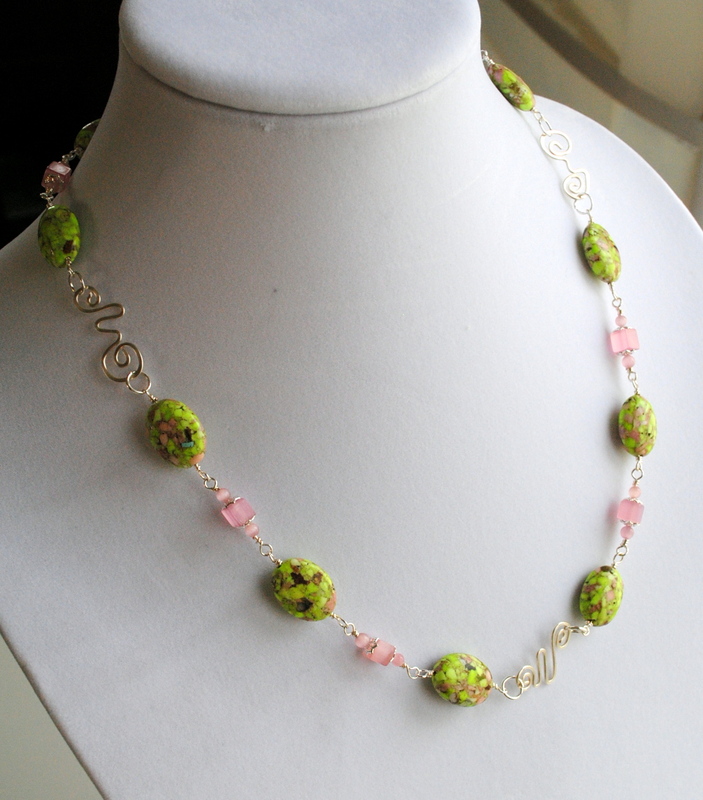 I added a beaded necklace created with glass beads that reminded me of shells to create this one of a kind look. 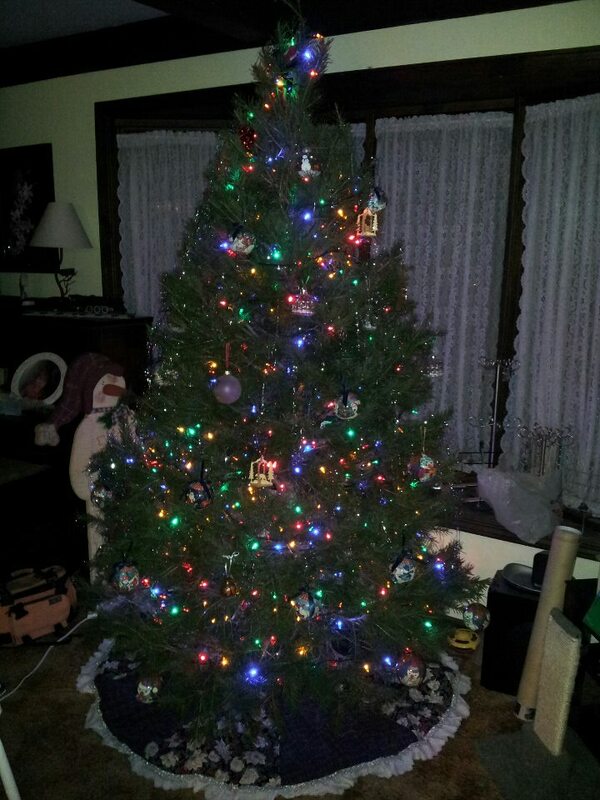 And as I promised...here's a picture of our Christmas tree decked out with all the lights and decorations. It makes the house seem more like Christmas now that this is done! Do you have a special decoration or ornament that you always have to put out at Christmas? two special presents for forgetting to give me one yesterday! 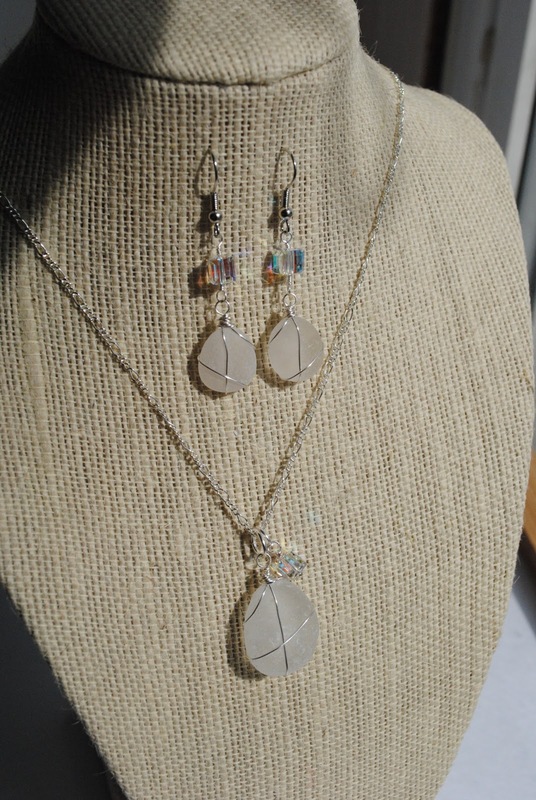 If you love Swarovski crystals, this first necklace/earrings set is going to make your eyes sparkle! Beautiful white sea glass and square Swarovski crystals make this necklace and earrings set the perfect gift! I originally designed this for a summer beach wedding, but it would be the perfect accessory for a holiday party or even to welcome in the New Year! 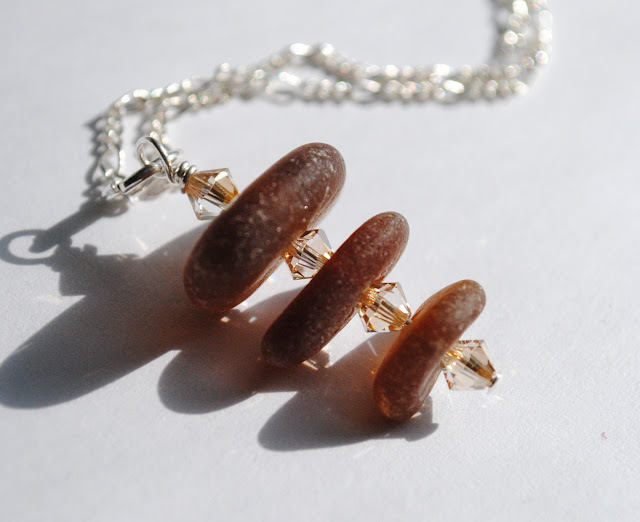 The second sale item for today is this gorgeous brown sea glass triad necklace. I have to confess, I didn't collect these pieces of sea glass. They were collected off the New England coast by a friend of mine. 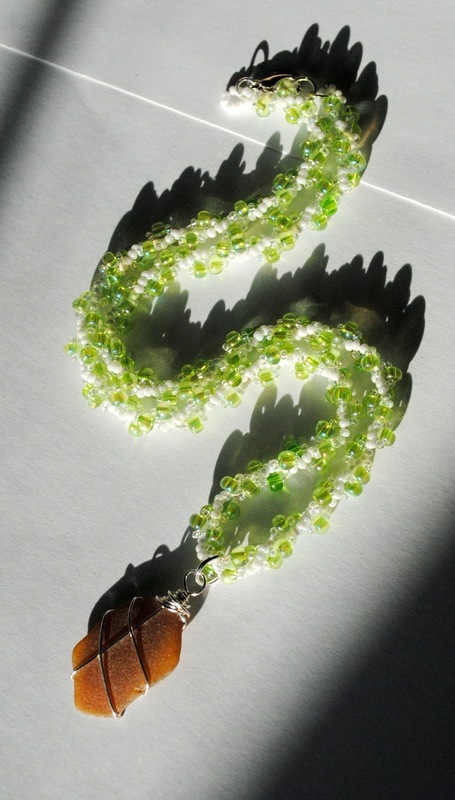 But they make a beautiful necklace and I love the sparkle of the topaz Swarovski crystals between each piece! You will find yourself reaching for this necklace again and again because of the simple elegance of the design. And the extra gift for today? Free shipping with code 121212 at checkout on your entire purchase. Still no lights on the tree but hopefully that will all change today and if it does, I will be sure to post pictures tomorrow! 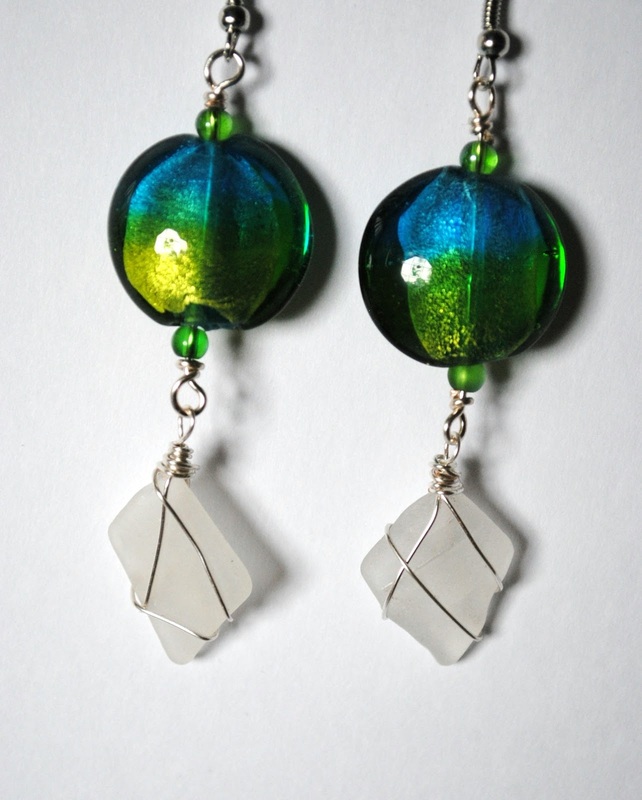 I love earrings with a little sparkle and swing! 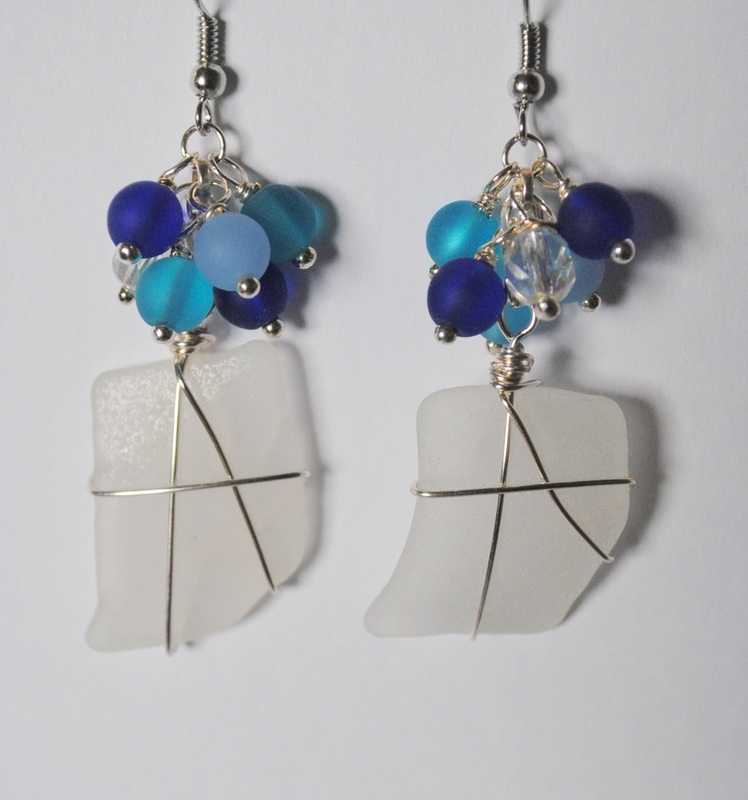 I paired two pieces of white sea glass with these blue and green metallic lampwork beads to create these fun earrings. It takes hours to sort through the sea glass I've collected to find two pieces that are similar in shape and color. 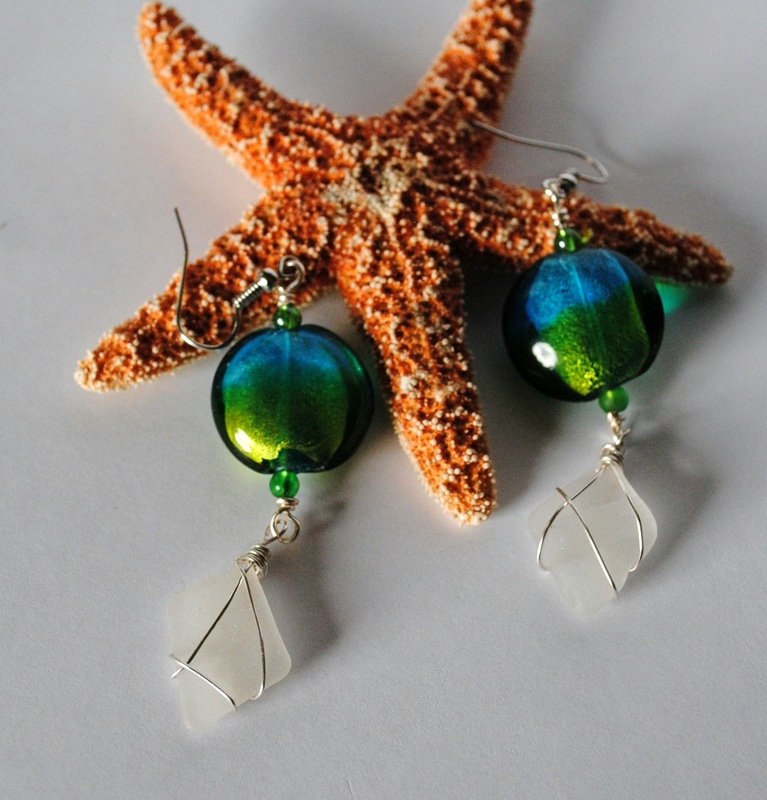 And each trip to the beach yields more pieces to match! 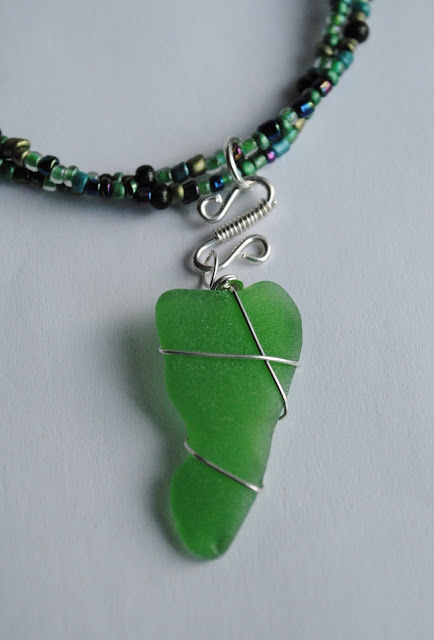 When I wrap the sea glass, I have to be sure that the pattern is similar on both pieces and that pattern needs to hold the glass securely as well as look beautiful. These smaller pieces are more difficult to wrap than the larger ones! We're still working on getting the tree decorated, but this year we're not rushing just to get done...we're enjoying the time together! 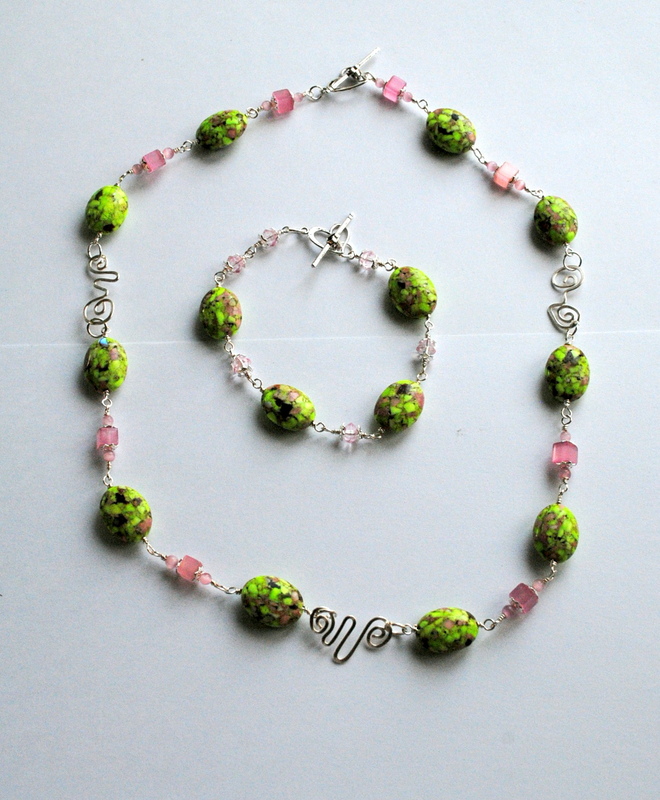 I found these gorgeous apple green and pink glass beads strolling through a bead shop and was mesmerized by them! 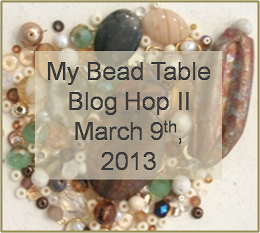 It took several days for me to decide how to use these beads, trying different styles and colors. 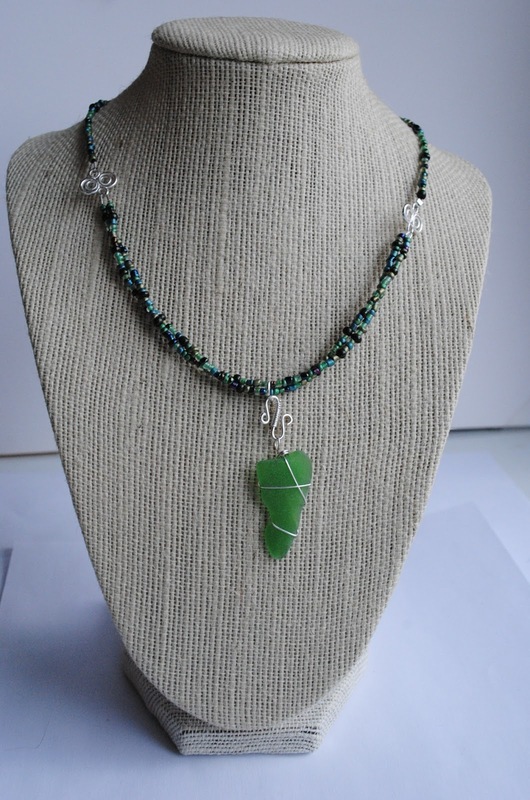 I really liked the way the beads looked when I wrapped each as a link instead of beading them together on a string. The Christmas tree is up, without lights or decorations yet. But I can look at it and think of the wonderful time I had with my family in finding it! I collected this piece of sea glass on one of my first trips to the ocean just to look for sea glass. 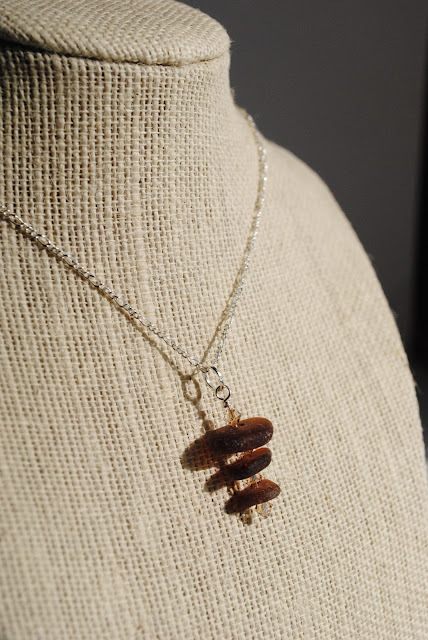 This piece is probably from a small brown bottle, because of the curve that it has. I tried using it as a pendant but it didn't lay right and kept turning. One morning my daughter was playing with the sea glass and put this piece on her wrist...and I had an "a-ha!" moment! 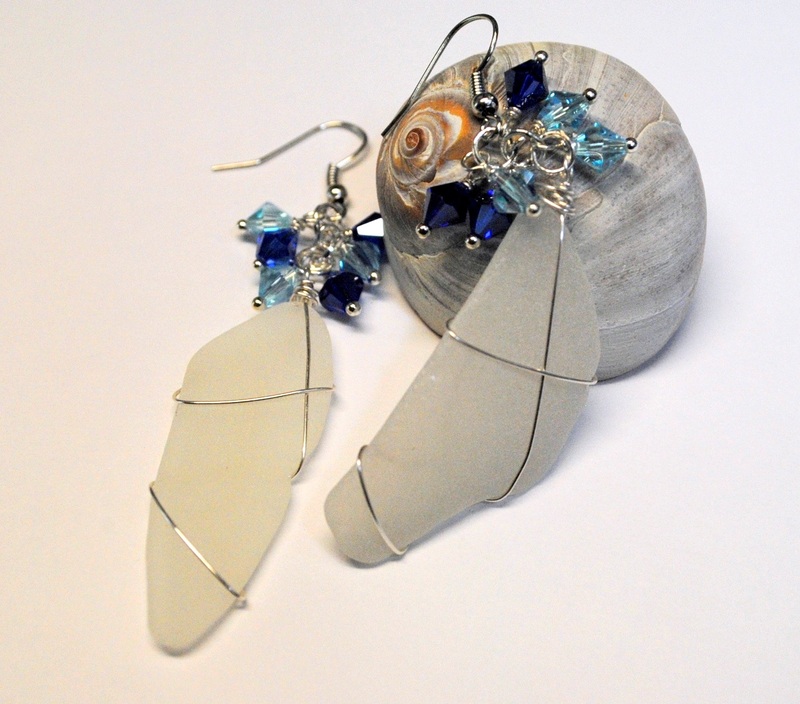 Sea glass is beautiful as a necklace and earrings...why not a bracelet? This bracelet is still one of my favorite pieces. 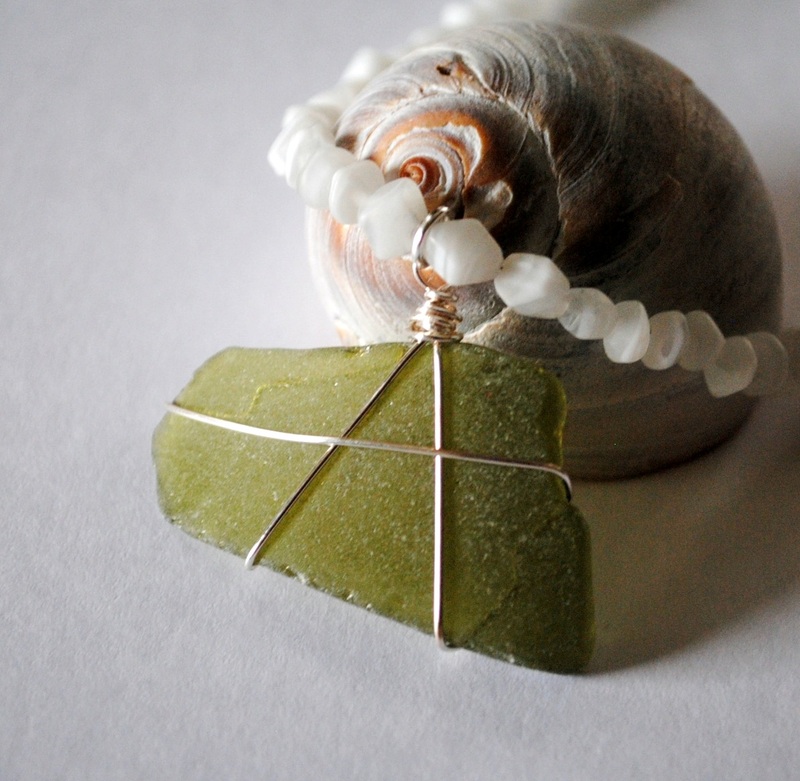 I had to figure out how to have a loop at both ends of the sea glass but not have the wire wrapping become the focus of the bracelet. 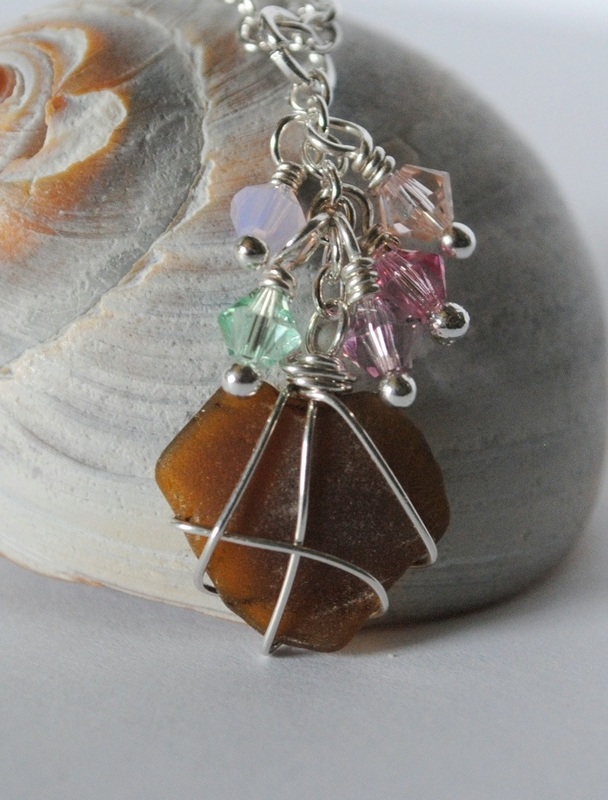 I also created infinity links in the same type of wire (but a thicker gauge) to help showcase the sea glass. It's already week 2 of December...what special holiday plans do you have for this week? We are getting our Christmas tree and decorating it. I can't wait! 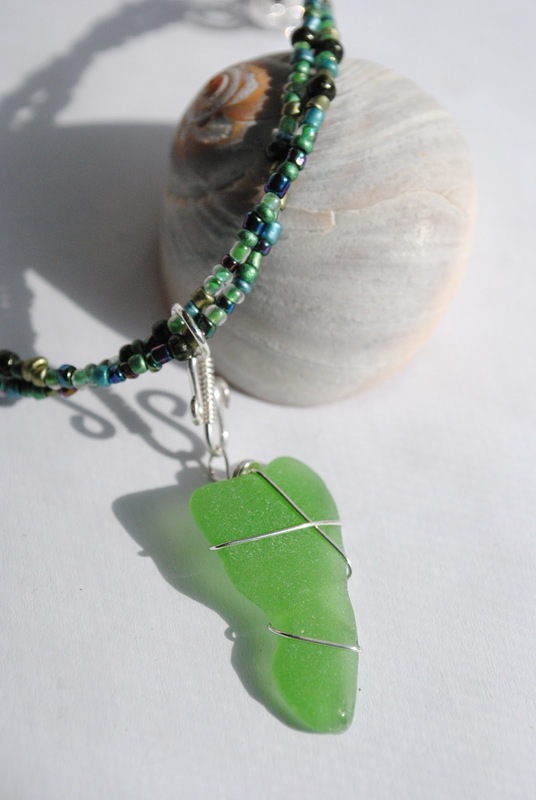 I love the green sea glass I find on the beach...the color varies with each piece. And I don't know why, but the shapes are really interesting! 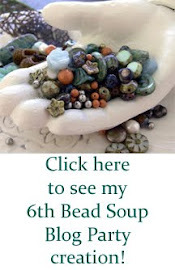 I found these beads browsing in a bead shop and had no idea what I was going to do with them when I bought them. 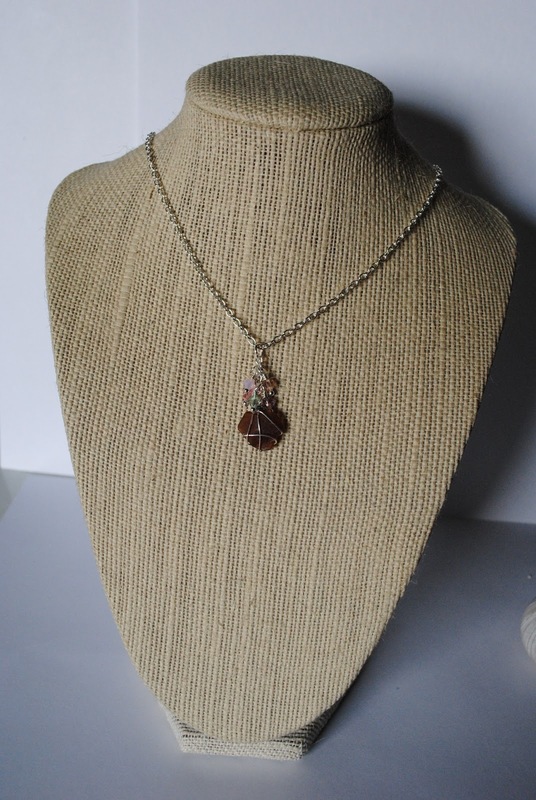 But as you can see, they accent this gorgeous pendant perfectly! I hope you are having a wonderful holiday season and are making sure to spend lots of time with family and friends. The special memories are created in the time spent together, not planning the "perfect" party. 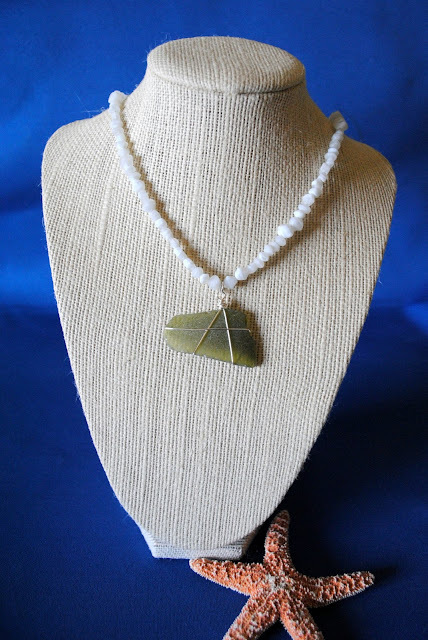 Tomorrow's featured item is one of my first creations and one of my favorites! Now that was hard to fit into the song, wasn't it??? 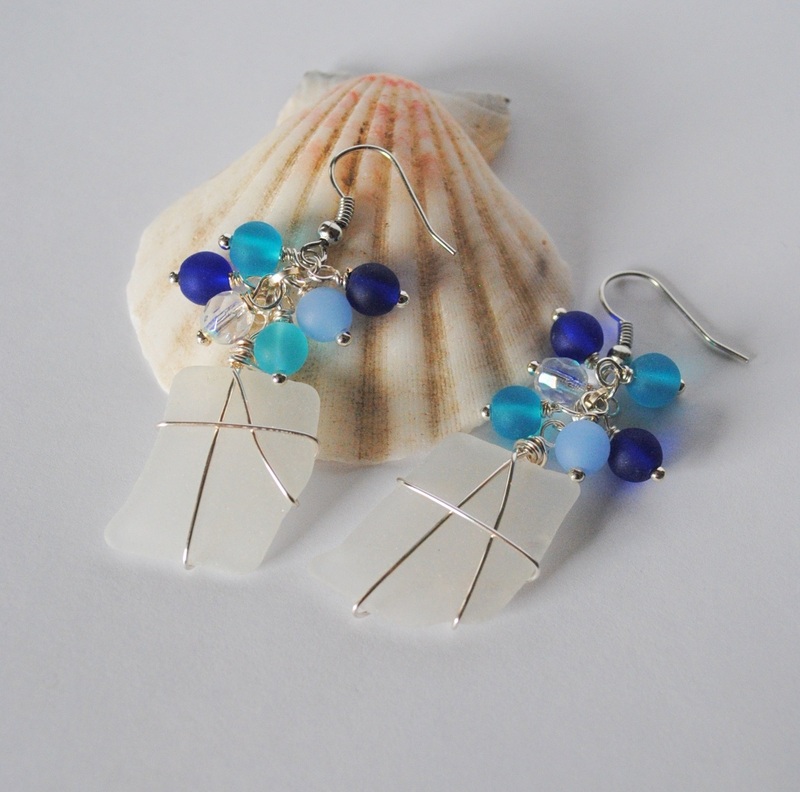 A few posts back, I mentioned that there is a difference between genuine sea glass that is collected off the beach and man-made or faux sea glass. Sea glass that has been collected off a beach has a unique frosted appearance. When you see it side-by-side with man-made sea glass, it's very easy to tell the two apart. Man-made sea glass also is uniform in its appearance, while authentic sea glass may be similar, it is never exactly the same. 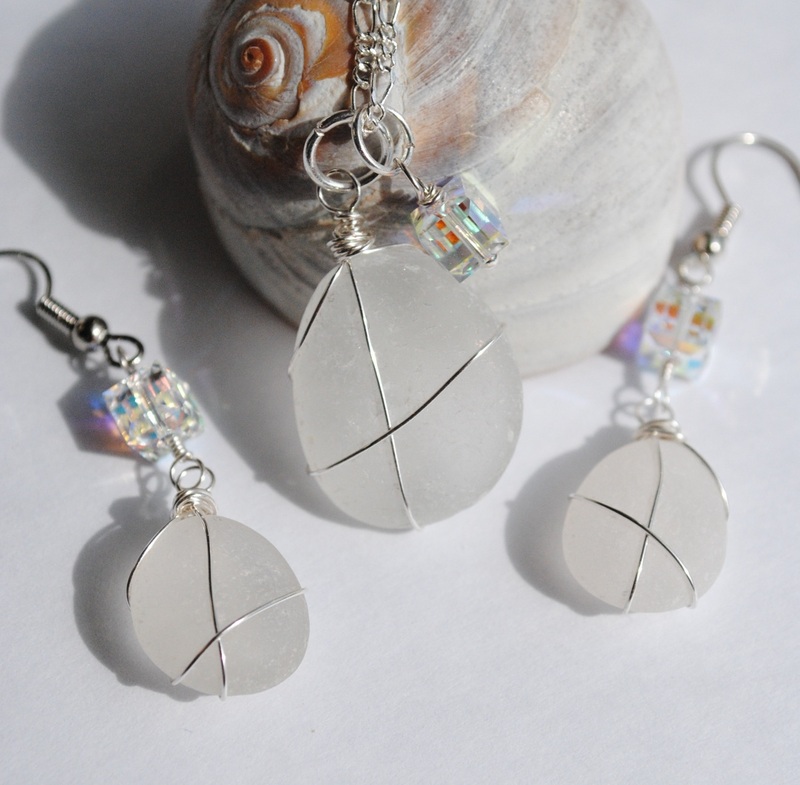 These earrings are a beautiful combination of white sea glass I collected over the past year and man-made sea glass beads. 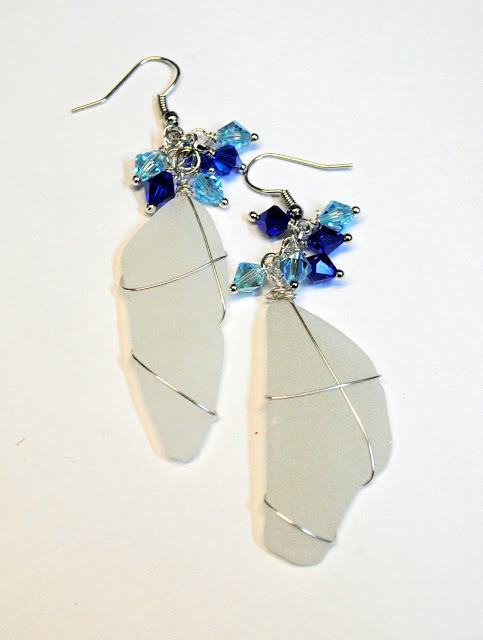 This sale is a great way to start your sea glass jewelry collection or add to your favorites! 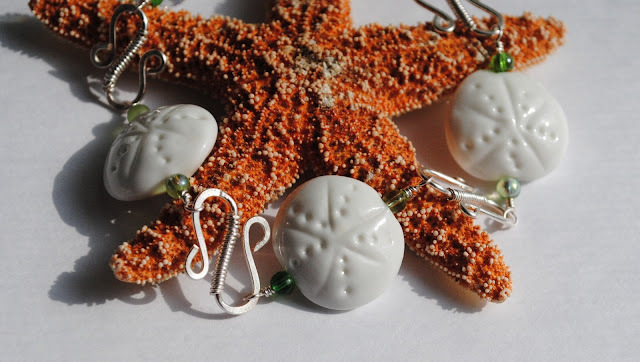 These beautiful artisan lampwork beads are 3-D...the white starfish is raised off the blue background and the orange spots add a fun texture. 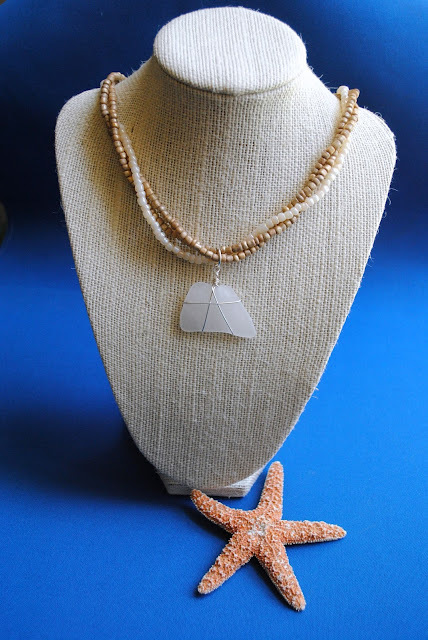 I had some jasper beads in all sorts of shades of orange that just made the starfish pop in the design. And of course the handmade copper infinity links added a touch of shine! Can you believe that tomorrow will be Day 6? The month is just rolling by! This week's Featured Artist is Frauke Avent of Handmade Fuzzy! A wonderful artisan and Lady! 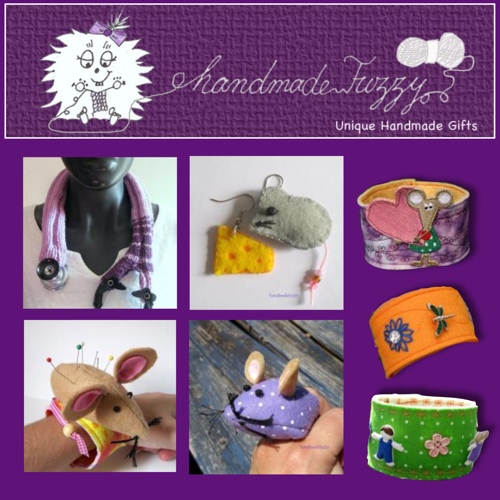 At Handmade Fuzzy you will find Unique handmade Gifts for everyone. She makes wondeful, personalized Stethoscopes and her Mice are just way too cute! All of her items are truly works of art and made with Love! Knit, Crochet, Felt... you will find something for everyone! Her one-of-a-kind items are ready to ship from my smoke-free home. I find all sorts of shapes of sea glass on the beach. Mostly they are geometric (like triangles and squares and such) but every now and again I see something different. 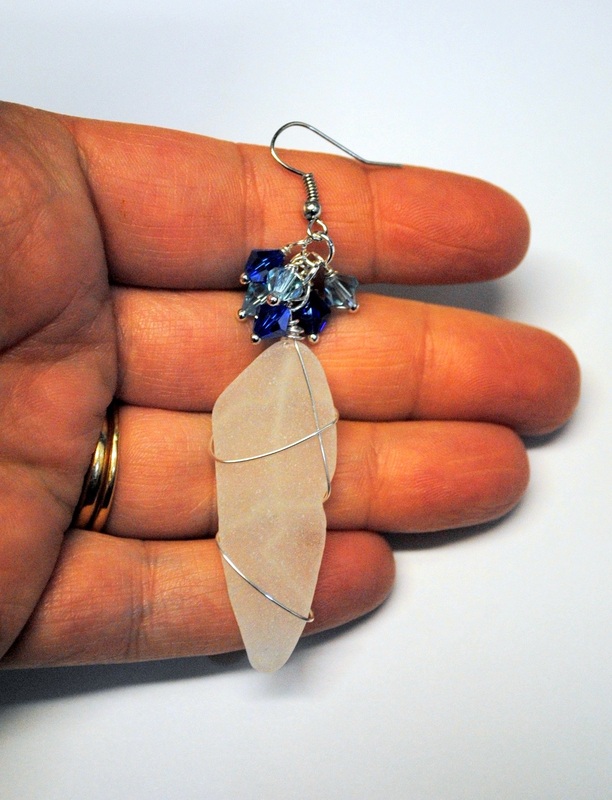 I remember when I found this piece...it had been a pretty meager day for sea glass. I had wandered up and down the beach without much success. And then the sunlight reflected off this piece in the sand. It is a small piece but just as beautiful as some of the large pieces I've found. I've only found a handful of heart-shaped pieces of sea glass and none have captured my imagination like this little beauty. 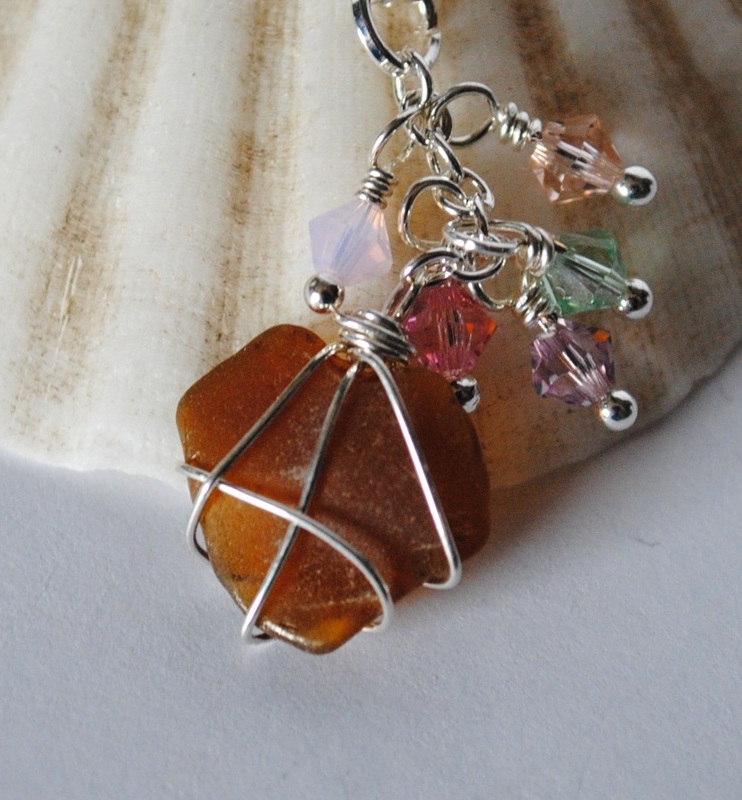 I added Swarovski crystals to create a pastel rainbow that draws your attention right to the brown sea glass heart. So, tomorrow is already day 5...can you guess what piece of jewelry I've chosen for tomorrow's sale? 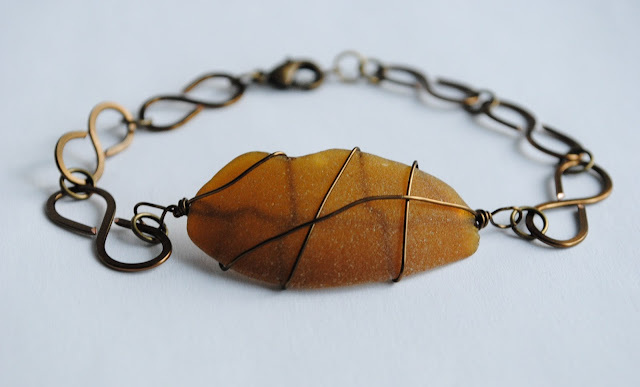 I started my jewelry journey with wire wrapping. It was the best way to create pendants with my sea glass. And it was only natural that as I started looking at the work of other artists, I would became interested in learning various wrapping techniques. Although simple to create, these links add visual interest that would be missing if I used something mass produced. 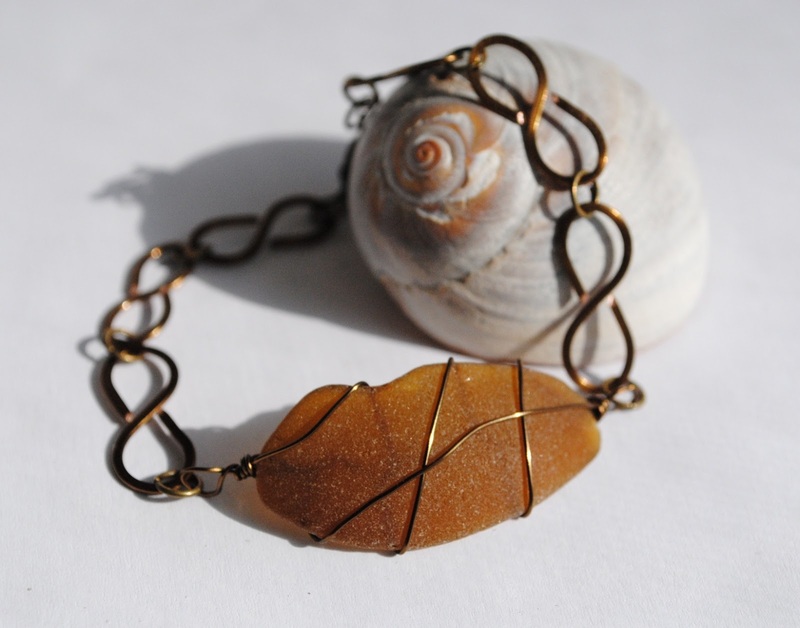 They give this bracelet a special touch that makes it truly one of a kind. 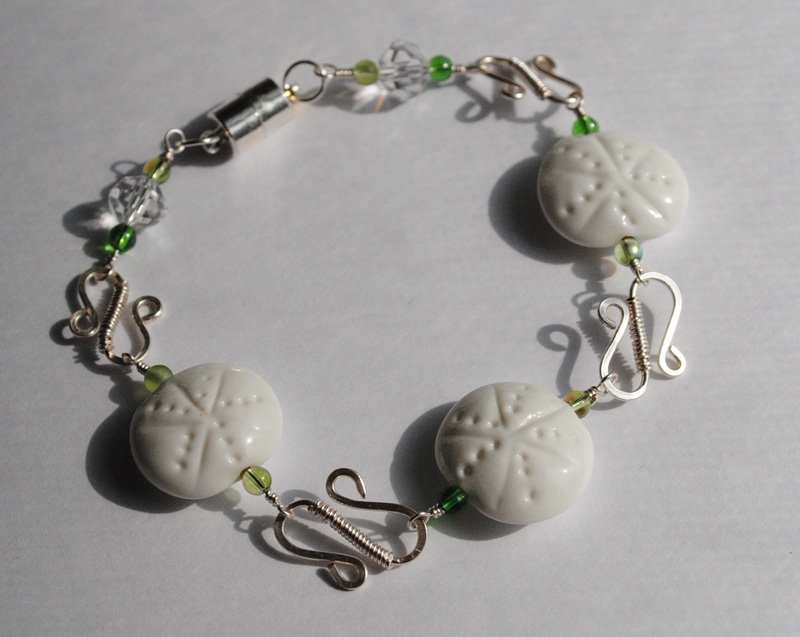 This bracelet is constructed of handmade lampwork sand dollar beads, small glass green beads and my handcrafted links. 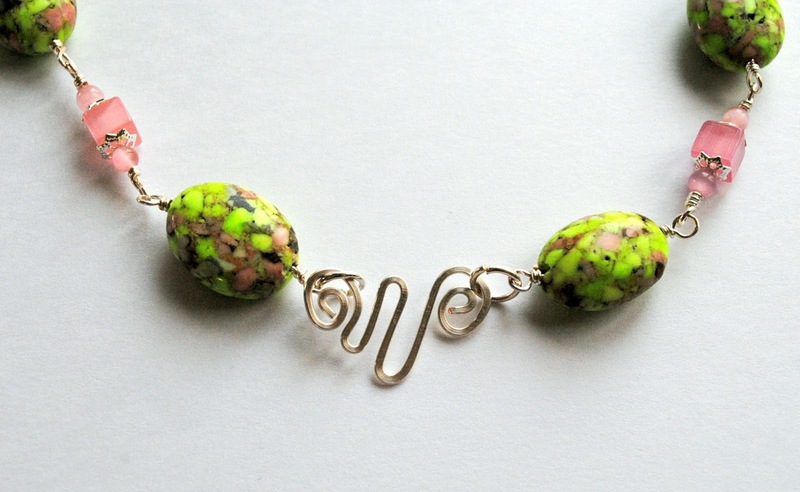 It's a fun bracelet, especially in the summertime. And I used a super strong magnet instead of a clasp so that it's easier to get on and off. I love the way this photo turned out...I was experimenting with different techniques and props at the time. I wonder what to put on sale tomorrow? OK, I told you yesterday that this probably wouldn't rhyme. I love the look and feel of sea glass. 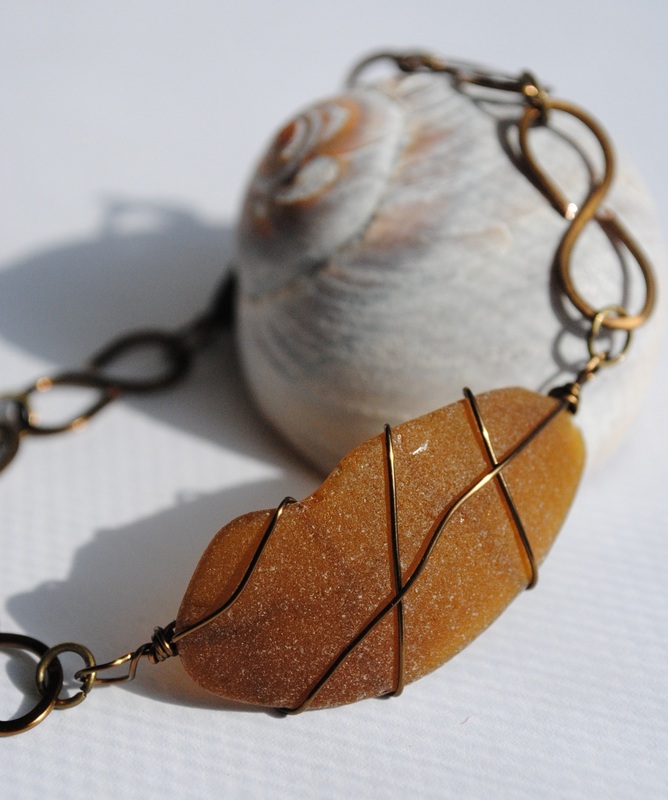 It remindes me of the quietness of the waves breaking on the beach. And so I use very simple patterns when wrapping my sea glass pendants, so that the beauty of the glass shines through. I've created a spiral rope chain for this sea glass pendant. 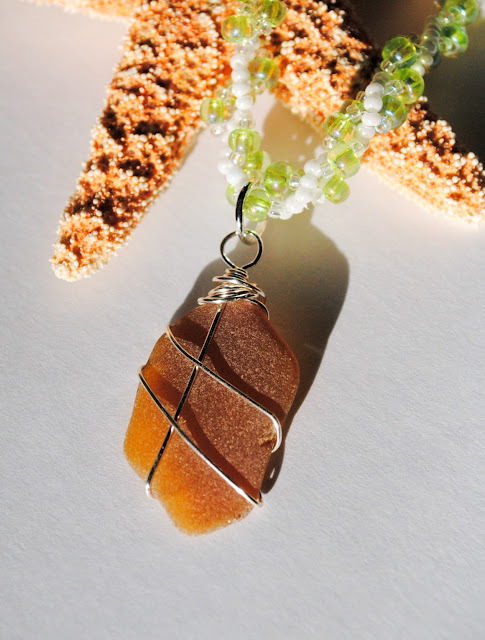 The small white beads shine like pearls and the green glass beads are a perfect backdrop for the brown sea glass.